Dr. John C. Dennis is a current faculty member of the School of Forestry and Natural Resources. at the University of Arkansas at Monticello (UAM). He teaches classes that are focused on land surveying and geographic information systems (GIS). 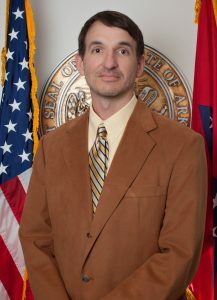 He has been an assistant professor at UAM since 2013. Prior to working at UAM, he worked for several local engineering firms in NW Arkansas where he served as a field-surveyor technician. Dr. Dennis is originally from South Louisiana where he graduated from Louisiana State University in 1998 with a BA in Anthropology. Following his graduation, Dr. Dennis worked for an environmental firm in Baton Rouge where he was introduced to land surveying and GIS applications while working on multiple archeological excavations as well as coastal restoration projects. After several years of working as an archeological field technician, he moved to Fayetteville, Arkansas, where he earned his MA in Anthropology in 2002 and his doctorate in Environmental Dynamics in 2012 from the University of Arkansas Fayetteville. He brings to the AGIS Board over fifteen years of experience in working with GIS related research and land surveying applications. Dr. Dennis is a licensed land surveyor (#1811) in Arkansas and is active within the profession where he is currently serving as the District 4 Director for the Arkansas Society of Professional Surveyors.